What is Microsoft Office 365 Email? Microsoft Office 365 Email, or Microsoft Exchange Online, is a cloud based email subscription service that provides a fast, secure and always available email system. You do not host the email system, Microsoft hosts it and you simply connect. Why Should I Consider Office 365 Email? Most IT professionals will agree that Microsoft Exchange Email with Outlook is best solution for businesses who require emails, calendars, tasks and contact sharing. However Exchange does require a suitable server, updates, backup, and IT support. Office 365 Email gives you all the features of Microsoft Exchange email with none of the hosting concerns. The system is hosted on Microsoft’s own servers giving almost 100% up time, worldwide availability via a secure website, and real time email on any capable mobile or desktop device. You simply connect to it to retrieve and send your emails. What do Aspect IT Provide? 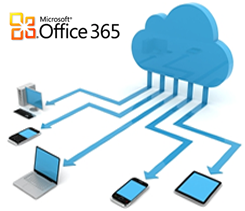 As a Microsoft Partner we can manage your setup and transfer to Office 365 Email. We will guide you through the process so you can be assured your setup will be right for your company’s requirements and will be configured correctly. The monthly cost for a single Hosted Exchange account is approximately £4, payable to Microsoft. Our setup cost starts from as little as £100 and will ensure you are set up and configured correctly, guiding through the whole process seamlessly. If you would like more information or would like to move to Office 365 Email, then don’t hesitate to contact us. Fill out the form below and we will contact you to discuss more.